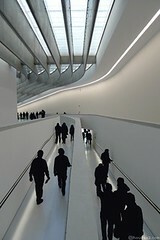 I really admire her work and the pictures of the Maxxi museum in Rome look amazing, there’s something very futuristic about the interior space it remind me of a space station. The exterior looks well established in a minimal landscape, as if its been there for since the sixties and has echo’s for me of Le Corbusier. Whats great about Hadids work for me is that every design is unique and different and its great to have clients with ambition and budgets to enable talented designers to create such a masterpiece. There are details of the event and some here at the Architect Journal.